Earlier today, Star Wars Celebration kicked off with the epic 40th Anniversary panel, where moderator Warwick Davis brought out a number of previously-confirmed guests such as Hayden Christensen, Ian McDiarmind, Peter Mayhew, Anthony Daniels, Billy Dee Williams and Mark Hamill. 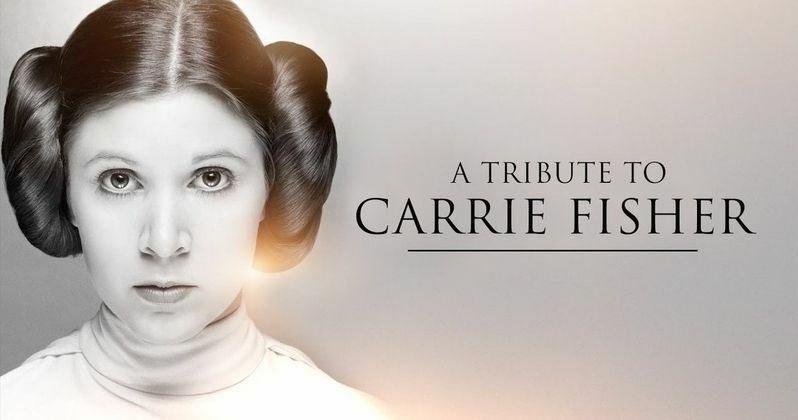 As expected, though, there were a few unannounced surprises, including a heartfelt tribute to the one and only Carrie Fisher, who tragically passed away in December. LucasFilm president Kathleen Kennedy and Star Wars creator George Lucas honored her memory by speaking about her in front of the convention crowd, along with her daughter, Billie Lourd, before fans were shown a heartfelt five-minute tribute video to honor her legacy, which you can watch below. During today's opening panel, Carrie Fisher's memory was honored with this touching tribute. This five-minute video from LucasFilm features a ton of behind-the-scenes footage from the original trilogy, and last year's iconic blockbuster Star Wars: The Force Awakens, and much, much more. Before the video was played for the fans in Orlando, and the millions watching during the live-stream, George Lucas had this to say about the unforgettable Carrie Fisher. "She was a princess. She was a senator. She played a part that was very smart, and she was having to hold her own against two big lugs, goofballs, who were screwing everything up. She was the boss. It was her war. When I was casting it, I said I really want somebody young to play the part. When Carrie came in, she was that character. She was very strong, very smart, very funny, very bold, very tough, there really wasn't much of a question. There are not very many people like her, one in a billion. For this particular part, it was absolutely perfect. She wore a dress through the whole thing, but she was the toughest one in the group. It was a hard part to play, and she pulled it off brilliantly." Shortly after Carrie Fisher's death, there was a rumor that General Leia Organa would be re-created digitally, but LucasFilm, which hardly ever addresses press speculation, issued a definitive statement revealing that they would not use a CGI version of Leia. Carrie Fisher had already filmed her scenes for Star Wars: The Last Jedi at the time of her passing, and there were also reports that reshoots would pay tribute to the late actress as well. While she would not address any of these reports at Star Wars Celebration, LucasFilm President Kathleen Kennedy did pay homage to the beloved actress. Here's what she had to say below. "She was unlike anyone you've known, unlike anyone in this room. Her humor, her insight her brilliance, when you associate Princess Leia, you realize that was Carrie." After George Lucas and Kathleen Kennedy's touching tributes, fans were treated to quite the surprise, an appearance from Carrie Fisher's daughter, Billie Lourd, who appeared alongside her mother as Lieutenant Connix in Star Wars: The Force Awakens. After receiving a huge ovation from the Star Wars Celebration crowd, the young actress went on to reveal what made her mother so special. Here's what she had to say below. "My mom used to say she never knew where Princess Leia ended and Carrie Fisher began. She was imperfect in many ways but her imperfections and willingness to speak about them are what made her more than perfect. My mom, like Leia, wasn't ever afraid to speak her mind and say things that might have made most people uncomfortable. (She) often openly fought her own dark side, knowing early on that we all have a dark side to fight, whatever it may be. But she knew that it wasn't about the fight you were fighting but how you fought it, the way you resisted. She taught me by her own example, that the most evolved person is seemingly a contradiction, they are both the strongest and the most vulnerable person in the room. And that was her. That is Leia." Tomorrow, on Friday, April 14, Mark Hamill will pay tribute to his beloved co-star with his own panel, "Mark Hamill's Tribute to Carrie Fisher," in which the actor remembers the talent, humor, and legacy of his friend and co-star. There will also be a panel for Star Wars: The Last Jedi tomorrow, where Carrie Fisher's character and legacy will almost certainly be discussed, and perhaps the rumors about her role will also be discussed. While we wait for those panels tomorrow, take a look at this tribute to this beloved Star Wars icon, the one and only Carrie Fisher.